Getaway at the Greenhouse: Philadelphia Parks & Recreationâ€™s newest pop-up to activate West Fairmount Park's Horticulture Center. There have been a lot of conversations and tweets around public spaces recently — how they are used and run, and by whom. Most recently, there’s been debate over a new coffee kiosk in Dilworth Park. The demand we place on public spaces is through the roof, but the resources to properly support and sustain them is often in the basement. We want our public spaces to do more, perhaps now more than ever. We have more people using public spaces and our seasons are getting longer, with earlier springs and hotter summers. People expect them to be maintained at exceptional levels and be programmed with free and diverse activities. Philadelphia Parks & Recreation is responsible for striking a balance between these demands and opportunities in support of an inclusive and sustainable citywide system of parks, rec centers, and playgrounds in every neighborhood. The question remains: If we want public spaces to do more for the benefit of all Philadelphians, how do we pay for it? Last week, Mayor Jim Kenney, Council President Darrell L. Clarke, Philadelphia Parks & Recreation, and partners announced that Love Park’s iconic “saucer” building will soon be home of Loveluck restaurant. Loveluck is the newest project by Philadelphia’s own restaurant powerhouse duo of Valerie Safran and Marcie Turney. It is the result of a public RFP (request for bids) process — that included public notices and meetings — and shows the value of public and private sector partners coming together and providing an amenity to attract people and invest resources back into the park. This is not new for Philadelphia Parks & Recreation. 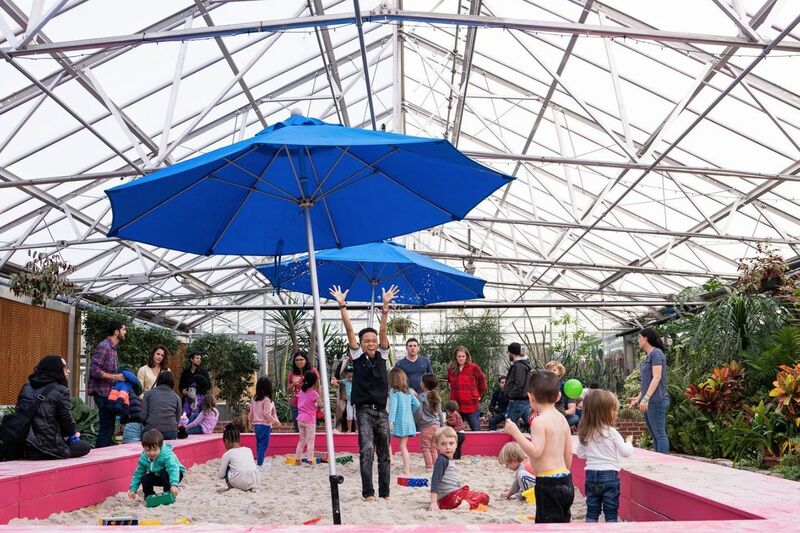 From our popular Parks on Tap program to our pilot this winter that turned West Fairmount Park’s Horticulture Center into a family-friendly getaway with free activities, Philadelphia Parks & Recreation has been at the forefront of innovative public space programming that brings public spaces to life and people together. Philadelphia has experienced a renaissance in great public spaces over the past 10 years. Good city leadership and significant public resources have helped make this happen. We’ve also had great allies in this work, such as the Schuylkill River Development Corp., Historic Philadelphia, Bartram’s Garden, Friends of the Wissahickon, and Center City District, which are equally responsible for the resurgence of our public spaces. We partner with these nonprofits not only because they can raise private resources, but also because of the leadership capacity and expertise they bring in service to the public realm. Kenney’s vision for our parks, rec centers, and playgrounds is that these public assets can be catalysts for change, prosperity, connection, and community. And he has a way to pay for it. Supported by the Philadelphia beverage tax, the Kenney administration’s Rebuild initiative is investing hundreds of millions of dollars to make Philadelphia a city where any resident in any neighborhood can count on having public spaces they are proud of, and that they have a role in shaping. It has been said that public spaces are contested spaces, meaning that everyone has an opinion about how the spaces should be used. As part of our civic commons, they are places that make room for lots of different people, tastes, ideas, and opinions. However, if recent conversations hope to increase constituency and advocacy for our public spaces citywide, they can’t be framed around scarcity. We can’t pull the plug on revenue generation – especially when that revenue supports the largest public space investment in the history of our city – without suggesting ideas for replacement funds to fairly support our public spaces. Not everyone will agree with every idea, but we can all agree that our public spaces are core to the culture and fabric of our city. The choice is ours – if we want the great public spaces that Philadelphians and visitors deserve, we need more ideas (not less) around how to pay for them. Maybe some of those ideas will even be fueled by caffeine or sugary drinks. Kathryn Ott Lovell is the Philadelphia Parks & Recreation commissioner. She oversees 700 full-time employees, more than 10,200 acres of land, 500 buildings, 166 miles of trail, 250 playgrounds, and thousands of programs and events throughout Philadelphia’s parks and recreation system.